Introduced in 1992, the Subaru Imperza WRX STi model was really popularized by the Fast and Furious film series. Check out this WRX STi fodder on the Fast and Furious WIKI page here - Fast and Furious WIKI. The Subaru WRX STi is an outstanding sport compact candidate for high performance upgrades. This means that the Impreza will definitely maintain its value, expecially if you commit to a regular service and maintenance schedule. Hey, why not have a little fun doing your own work and save at the same time. The Motor Bookstore has been serving the DIY community with their literature needs since 1997. Give us a call or drop this manual in the cart so you can have what you need to tackle your own service and repairs on your Subaru Impreza WRX STi. From simple maintenance tasks like a brake job to more complex engine overhauls, you will surely feel empowered with this manual in your toolbox. 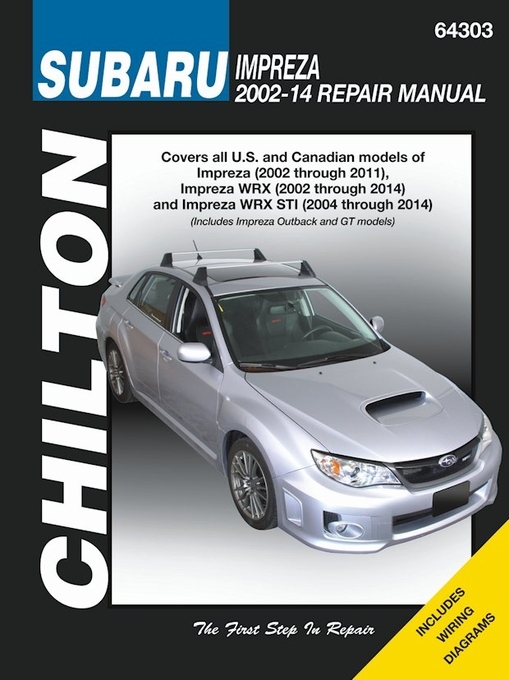 Ask a question about Subaru Impreza (WRX /WRX STI) Repair Manual: 2002-2014. This manual was ok but not a good as the Haynes Manual. I needed crankshaft journal diameter specs that I could not find in this manual. Merchant's comment: All Chilton Total Car Care manuals published after 2000 (when Haynes purchased the line) are word for word and diagram for diagram the same as their Haynes counterpart. There are two major differences between the Haynes and Chilton manuals published for the same make/model: 1. A Chilton has two text columns per page instead of three like the Haynes. This results in more pages and larger font. 2. The Chilton includes a Master Index at the back of the manual and the Haynes does not. Just what I was looking for. Arrived promptly and was just as described. I had a great experience with themotorbookstore.com. I was unable to find this book in Stock at any stores or websites like amazon.com. they delivered my item at a reasonable speed and are providing customers with great service. I would definitely recommend to others.